Elizabeth Warren has a problem. Actually, several. It’s not President Trump calling her Pocahontas. It’s the liberal Berkshire Eagle, asking her to take a DNA test and back up “family lore” with scientific evidence of Native American ancestry. It’s not Mitch McConnell. It’s a dozen Senate Democrats who, according to Politico, are ready to defy her, by joining their Republican colleagues to pass a bill that weakens banking regulations and undermines her signature cause. And, it’s not Bernie Sanders. It’s Deval Patrick, the former Massachusetts governor, who can look over the border and project a New Hampshire primary win. No one from Massachusetts has made it to the Oval Office since Jack Kennedy. But that track record doesn’t dissuade Bay State dreamers from their Granite State game plan. That would be Warren’s strategy, too. 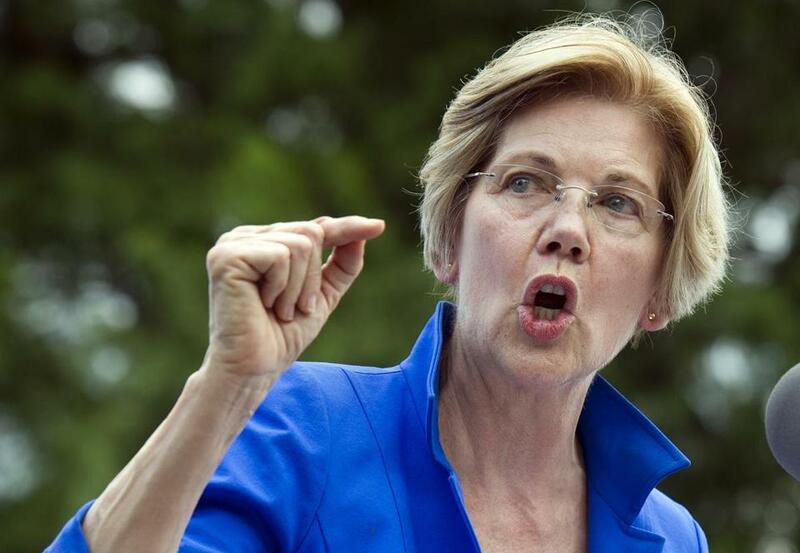 But despite a high national profile and town halls packed with admirers, a 2020 bid by Warren looks more fragile, especially with Patrick expressing interest. He has charm, unsullied progressive credentials, and an immediate connection with African-Americans. If he ever won the nomination, Republicans would find plenty of baggage from his years in office to use against him. But Democrats, ever susceptible to sweet-talking seduction, might overlook it. Warren, meanwhile, is at a weird moment in her political career. The Senate advanced legislation Tuesday to roll back some of the safeguards Congress put in place to prevent a repeat of the financial crisis. She’s up for reelection to the Senate, a race no one really believes she can lose. Yet three Republicans are seeking to challenge her — because of her national profile, not in spite of it, as the Globe recently reported. On one hand, she’s the face of the progressive left. On the other, she upset the progressive left by supporting Hillary Clinton over Sanders in the 2016 presidential race. She also irritated some in the African-American community when she endorsed Mayor Martin J. Walsh in Boston’s recent mayoral contest. It was an endorsement Walsh hardly needed, given that, 66 to 34 percent, he swamped Tito Jackson — a former aide to Patrick and the first African-American in 35 years to make it to the general election ballot. Fallout from that election likely explains why Warren has not endorsed incumbent Michael Capuano in his congressional primary fight against Boston City Councilor Ayanna Pressley, who is also African-American. What’s playing out in Washington with the banking bill reveals a schmoozing deficit that makes it harder to see Warren as party uniter. But her biggest problem is, of course, the credibility deficit that connects back to the controversy over her ethnicity. Her undocumented claims of Native American ancestry trace back to her first run for Senate, in 2012. As she explains it, she relied on family lore. What she never explained is why, from 1986 to 1995, she listed herself as a minority in a legal directory published by the Association of American Law Schools — or why she stopped. Harvard University and University of Pennsylvania both listed her as Native American on federal forms. When Harvard Law School was criticized for a lack of ethnic diversity in 1996, a spokesman for the law school also told the Harvard Crimson Warren was Native American. All parties say that had nothing to do with any hiring or advancement. But then why self-identify that way in a professional directory and why tout it as an illustration of institutional diversity? I’ve written before about the disproportionate unfairness of decrying Warren’s dodge on this matter, given Trump’s blatant lies on so much more. Yet, as reported by the Globe, it’s a political reality for Warren that’s not going away. In urging her to take a DNA test, The Berkshire Eagle said she should reveal the results, whatever they are. “Handled properly it could become a testimonial to her integrity and truthfulness at a time when that quality is in short supply among the nation’s leadership,” writes the editorial board. With transparency, the board also notes, “She has nothing to lose but her Achilles’ heel.” Agreed — at least when it comes to one of them.